The year has been pretty tame for me in terms of going out as compared to the end of 2009. I think it's great because I get to sleep at least 10 hours a night - enough to make me feel rested at least. Last night, I kinda wanted to watch The Blue Rats at Handlebar, but decided on it for various reasons. I couldn't say no to Angelique when she asked me to go out for a round, though. 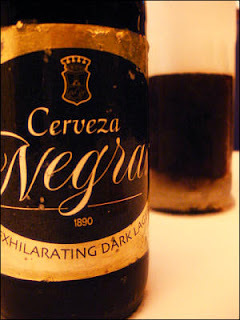 Cerveza Negra - a dark lager that doesn't taste like any other beer I've had (not that I have had a lot of different kinds of beer). It's made by San Miguel and tastes nothing like San Mig Light. I know I will have to pay for it on the treadmill but those two bottles were worth it! I wonder if this tastes anything like Guiness? I have some friends who will swear by Guinness, but I haven't had the chance to try it. What's your beer of the moment? Negra when I come back!!! Hoy pasalubong na din when you get back. Wehe, humirit pa talaga. Ha ha tan yan! Thanks, Noelle. Let's have some fun when I get back!